Bangalore is the capital city of Karnataka and the seventh largest city in India. It is also known as the Garden City because of its many beautiful gardens and parks. The Bangalore city was founded in the 16th century and has since been an important administrative center of India. Because of the high concentration of IT industry, it is also called the Silicon Valley of India. Legend says that the city is named after an old woman, who lived in this area and offered a humble meal of boiled beans to a lost Hoysala ruler. The city of Bangalore came into origin in the early 16th century, when Kempegowda, a local chief, built a small mud fort here. Bangalore gained prominence in the 18th century, when it became an important fort city, under the regime of Hyder Ali and Tipu Sultan of Mysore. The British defeated Tipu Sultan and took over Bangalore city. In 1831, the British made it the regional administrative city and established a big cantonment here. Apart from the numerous gardens, Bangalore also has some historical sites and other places of interest. 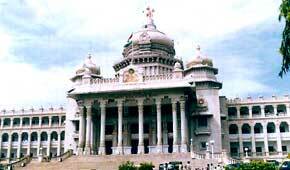 The Vidhan Soudha or the State Secretariat, built in 1954, is the main attraction of this city. It is a marvel of modern architecture and a fine amalgamation of traditional Dravidian and modern styles. Cubbon Park, the 120-hectare park located near the Vidhan Soudha, has a number of neo-classical styled government buildings. 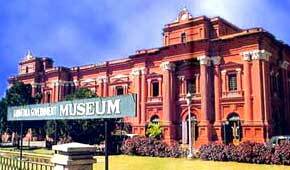 The Government Museum of Bangalore (one of India's oldest museums) and the Visvesvaraya Technological and Industrial Museum are important museums within the city. The Lal Bagh Botanical Gardens, which holds a number of flower shows is located on the southern fringes of the city. The 18th-century Tipu Sultan's Fort and Palace, the 16th-century, Dravidian-styled temple dedicated to Nandi the Bull, the Venkataramanaswamy Temple, the Gavi Gangadhareswara cave temple and the Someshwara Temple are other important temples in the city. The Ulsoor Lake is an important picnic spot. Bangalore city is also famous for it numerous Yoga centers that attract the tourists all round the year. Bangalore Airport is 13 kms east of the City Station. There are number of regular flights to important cities like Kolkata, Mumbai, Delhi, Hyderabad, Chennai, Ahmedabad, Goa, Kochi, Mangalore, Pune and Thiruvananthapuram. Bangalore has direct international flights to Muscat, Sharjah and Singapore. It is also a stopover for many international flights. The Karnataka State Road Transport Corporation (KSRTC) buses and buses belonging to Tamilnadu and Goa Roadways also operate from the Bangalore bus stand. The road network connects well Mysore (3 hours), Hospet (9 hours), Chennai (8 hours) and Mumbai (24 hours) with Bangalore. The KSRTC conducts a number of tours and excursions around the city. There are two railway stations in Bangalore. The Major cities of India are connected well with Bangalore through the rail network. There are a number of daily express trains from Bangalore to other cities of India. One can get prepaid taxis and auto-rickshaws to move locally. Local Bus service within Bangalore city is quite good. One can also avail of rented cars to move within the city.